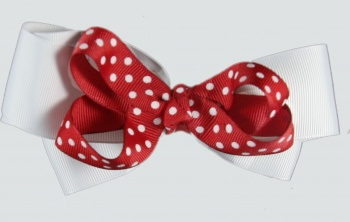 Double Layered Bow with White and Red Patriotic colors. The base bow is a brilliant white layered by a red with white polka dots bow. The center is wrapped with the same polka dots ribbon into a French knot and attached to a French clip. Wear this for any occasion or for every American Holiday!